This newsletter demonstrates our extensive experience with private school projects and gives a wrap up of projects we are currently documenting, staff news and the tour of the Gerard Lighting Building. Secon wish to thank all who attended the Gerard Lighting tour on the 26th February 2013. It was a huge success. 100 people attended a tour of the newly built premises at Fullarton Road, Rose Park. The evening’s proceedings were chaired by Anthony Davidson (Secon Principal Electrical Engineer and IES SA Vice-President). Anthony also wore another hat on the night - as the electrical engineer on the project he also led one of three tour groups. The attendees were welcomed to the facility by Gary Savage (CFO Gerard Lighting). Barry Matthews (Matthews Architects) gave a brief synopsis of the architectural design elements of what is now an iconic structure on Fullarton Road overlooking the picturesque Victoria Park. Anthony Davidson gave an overview of his experience with the client/design team and outlined the building’s electrical and lighting features. The tour of the building broken into the three groups (led by Barry and Gerald Matthews and Anthony Davidson). Once the tour of the building was completed the attendees enjoyed canapés and refreshments on the building’s top deck - aptly named “Park View” - until 9.15pm. The heavens were also very kind to those gathered with a beautiful balmy night and a rosy-pink sunset! A big thank you to Mick Reidy for all his effort in making the night a success (even though he was home on the sick list). Thank you to Gerard Lighting for their permission to hold the meeting as well as the after-tour function at “Park View”. Secon would like to thank the IES, (in particular Mick Reidy), Gerard Lighting and Matthews Architects for all their involvement in making this such a successful evening. The new Building design was based on satisfying 4.5 star Nabers requirements with the key element of bringing daylight into the building and all spaces having a view to the outside world. The lighting design for the offices was based on “what I’d like if I was working in the building” and LG7 European Lighting Guidelines, viz. to understand the constraints of the building, let the lighting design work within those constraints by providing the appropriate illuminance for the task, and illuminating vertical as well as the horizontal planes to create visual interest with the lighting design. Some of the design considerations, building constraints and features of the building include the following. The ceiling height increasing from 2.7 to 3.0m during documentation and the ceiling void not increasing in size resulting in many areas almost all of the ceiling space being taken up with mechanical ductwork and plant. Daylight harvesting and occupancy sensing, scheduling of external lighting to suit the time of day and the building’s use. Local lighting control provided in smaller rooms but the main control for the office areas by C-Bus touch screen in the foyer of the 1st and 2nd floors. Main conference room of the 1st floor can be separated into 2 meeting rooms and 2 smaller conference rooms. A C-Bus touch screen located in the lounge area can control all rooms or local switches when the space is broken into smaller rooms. A Crestron AV touch screen is installed near the bar to control the projector, motorised screen, amplifiers and speakers, it also integrates with the lighting. The AV system in the conference rooms can be split into 2 zones or combined as one, depending on the rooms configuration. Exterior of the building to be different to other office buildings along Fullarton Road, resulted in the recessed LED for the balcony on the 1st floor adjacent the meeting rooms. 1st Floor foyer to be a grand entry to the building, a Traxon mirrored RGB panel on the wall to provide moving graphical images controlled by DMX512. The Gerard Lighting building fulfilled the clients’ very specific needs and was delivered on time and to budget. The project is a shining example of integrated architecture and building services providing a beautiful building. Photography courtesy of Matthews Architects, Tony Lewis and Jeslie Images. A big thank you to Matthews Architects for getting these photographs to us at short notice. Secon have been appointed as building services consultants for the redevelopment of the Eldercare Facility at Acacia Court. Working closely with the client (Eldercare), the Project Manager (Synergy), the Architect (C4 Architects), the Quality Surveyor (John Boucher) and the Civil/Structural Engineer (PT Design) on a staged reconstruction we will completely replace the existing 120 bed facility with a new 147 bed facility, whilst maintaining full operation of the existing facility. We wish to congratulate Christopher Lenden-Barnes (Secon Drafter/Modeller) on his appointment as Drafting (BIM) Services Manager. This was the latest stage for the Aldinga Primary School. So far 5 stages have been completed incorporating an administration area, general learning areas, a church and multi-purpose hall have been constructed . Secon provided full Revit documentation for all services. This project was produced using Building Information Management (BIM) modelling where architectural, structural and services were fully co-ordinated using Revit. This project included a VRV air conditioning system with building management, heat exchangers, economy cycles, exhaust systems, dust extraction system, high density fast ICT infrastructure, BMS control system, VoIP telephone and 2.4km fibre cable run through street between the secondary and primary schools. New administration building consisting of offices, meeting rooms, GLA classrooms and toilets. Secon provided mechanical, Electrical, Electronic, Hydraulic, Fire and ESD services. Heat recovery ventilators were provided to economically provide outdoor air to the classrooms. Well done to Chris Mantle who came up with the winning caption "Right, who's got a chain block?" 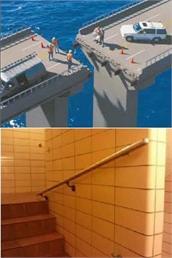 for our last construction mistake image. A bottle of wine is the prize for the person who comes up with the best humorous caption for the bottom image shown here.